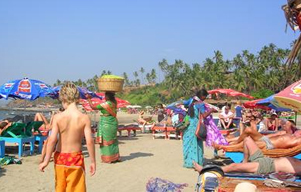 Goa Golden beaches tour is entrenched in the culture and lifestyle of this smallest Indian state. Blessed with the natural beauty of coconut fringed beaches lined by unlimited expanse of sea, Goa is thronged by tourists who desire to observe and soak its undulated bliss. The sun, sea and sand conspire together and take tourists to a world of dreams where every thing is laidback and relaxed. Beginning with a magical excursion to Mumbai, the tour takes a U-turn to the state where carefree, lazy and languish moments await every tourist. On arrival in Mumbai, you will be received by an Incredible India tour representative who will assist your transfer to the hotel. Check in into hotel followed by overnight stay. Day 2 will be rushing in front of your eyes like a Technicolor cinema reel where you will be exploring Mumbai, the city of dreams and its varied colours. 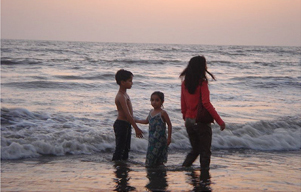 Famous Juhu beach, Gateway of India, Elephanta Caves form the highlights of this day's excursion. Later this day, you will be taken to a Bollywood film studio, Film City where you might spot your favourite actor performing on the command of Lights, Camera, Roll Sound and Action! Inside the studio only, relish the flavours of movie making with masala dinner. Overnight at hotel. Next day, you will take off on a flight to Goa, the tropical beach paradise. On arrival, you will be transferred to hotel. Rest of the day is free to relax on the beach. In the evening enjoy the gala celebrations of Goan Carnival Theme dinner as the state extends its welcome on you. A carnival is a living testimony of Goa's rich Portuguese heritage. Here, you will find the colours of Goa in full swing with music, dance over a course of lavish wine and dine. Delightful buffet dinner is a part of this celebrated dinner in Goa. Overnight at hotel. Discover the heritage of North Goa & South Goa on Day 4 of Goa golden beaches tour. Visit Arambol, one of the prominent fishing villages of Goa. These tiny fishing spots are a part of Goa's rich cultural fabric. The village features two beaches that form a perfect backdrop for fishing. After catching fresh fish, return back to hotel for overnight stay. Day 5 is kept free for you to relax and enjoy the serenity of golden beaches of Goa. In the evening, enjoy the scrumptious Sea food Bar-be-cued on the beach as a farewell dinner. This forms one of the wonderful dining experiences where you and your special one enjoy a secluded meal in the company of glittering stars and sea stretch. A local musician playing the romantic tunes on guitar strings adds on more magic to these unforgettable moments of dining on the beach. After this wholesome dining experience, return back hotel for overnight stay. Last day enjoy last breakfast in the gorgeous state of Goa. After check-out from hotel, transfer to airport where you take off from generous Goa for onward flight to Delhi / Mumbai.